Editor’s Note: The State and the Ranger Service were beset by political strife and corruption in the early 1930s. Unqualified individuals were appointed as Rangers through political patronage. Veteran Rangers resigned rather than serve with unqualified appointees. Prisoners, such as Clyde Barrow (of Bonnie & Clyde infamy), were paroled in large numbers raising allegations of bribery. In 1935 the Legislature had enough and organized the independent Texas Department of Public Safety. Officers were subject to oversight by a citizen Public Safety Commission. Rangers were commissioned by the Director, not the Governor. Art. 4413(l). CREATION OF THE DEPARTMENT OF PUBLIC SAFETY – There is hereby created a Department of Public Safety of the State of Texas, hereinafter designated as “the Department,” in which is vested the enforcement of the laws protecting the public safety and providing for the prevention and detection of crime. The Department shall have its principal office and headquarters in the City of Austin, where all of its records shall be kept. Acts 1935, 44th Leg., P. 444, ch. 181, sec. 1. Art. 4413(2). CREATION OF THE PUBLIC SAFETY COMMISSION – The control of the Department is hereby vested in the Public Safety Commission, hereinafter designated as “the Commission,” which Commission shall consist of three citizens of this State. The Governor shall, within thirty days after this Act shall take effect, appoint the members of the Commission by and with the advice and consent of the Senate to hold office until December 31, 1935, and they shall constitute the Public Safety Commission; and on the 1st day of January, 1936, the Governor shall appoint one member to hold office for two years, one for four years, and one for six years, and at the end of every two years thereafter, the Governor shall in like manner, by and with the advice and consent of the Senate of the State of Texas, appoint one citizen of Texas as the successor of the member of the Commission whose term shall expire in that year, to serve as such member of six years and until his successor is appointed and qualified. The Commission shall elect annually one member of the Commission to serve as chairman thereof. Two members of the Commission shall constitute a quorum. In the event of a vacancy occurring on said Commission, the Governor shall appoint a new member of the Commission to fill the said vacancy for such unexpired term, such appointment to be subject to the advice and consent of the Senate of the State of Texas, at the next session thereof. The members of the Commission shall be elected because of their peculiar qualifications fitting them for these positions. In the appointment of the members of the Commission, the following qualifications among others shall be observed: Knowledge of laws; experience in the enforcement of law; honesty, integrity; education, training and executive ability. They shall serve without compensation, but shall be entitled to receive Ten ($10.00) Dollars per day as an expense account and necessary mileage in the performance of their duties, such expense allowance shall not exceed Five Hundred ($500.00) Dollars annually for each member. Acts 1935, 44th Leg., P. 444, ch. 181, sec. 2. Art. 4413(3). ORGANIZATION OF THE COMMISSION – The Commission shall meet at such time and places as they may Provide for by rules or as the chairman or any two members may call. Acts 1935, 44th Leg., P. 444, ch. 181, sec. 3. (1) The Commission shall formulate plans and policies for the enforcement of the criminal laws and of the traffic and safety laws of the State, the prevention of crime, the detection and apprehension of violators of the laws, and for the education of the citizens of the State In the promotion of public safety and law observance. (2 )It shall organize the Department and supervise its operation; it shall establish grades and positions for the Department, and for each grade and position it shall designate the authority and responsibility within the limits of this Act. For each such grade and position so established, the Commission shall set standards of qualifications and shall fix prerequisites of training, education and experience, and shall make necessary rules and regulations for the appointment, promotion, reduction, suspension and discharge of all employees after hearings before the said Commission; that any officer or employee of the said Department who shall be discharged shall upon application to the Commission be entitled to a public hearing before said Commission and the Commission shall determine whether such discharge shall be affirmed or set aside. All persons inducted into the service of the Department shall be considered on probation for the first six months and at any time during such period they may be discharged if found to be unsuitable for the work by the Director, with the advice and consent of the Commission, and, if so discharged, such persons shall not be entitled to the public hearing hereinabove provided for. (3) The Commission shall establish and make public proclamation of all rules and regulations for the conduct of the work of the Department as may be deemed necessary and as may not be inconsistent with the provisions of this Act or of the laws of the State. (4 )The Commission shall maintain records of all proceedings and official orders. (5) The Commission shall biennially submit a report of its work to the Governor, and the Legislature, with its recommendations and those of the Public Safety Director. A quarterly statement containing an itemized list of all moneys received, and from what sources received, and all moneys expended and for what purposes expended, shall be prepared by the Director sworn to and filed in the records of the Department and a copy shall be sent to the Governor. Acts 1935, 44th Leg., P. 444, ch. 181, sec. 4. Art 4413(5). DIRECTORS; AND ASSISTANT DIRECTORS; SALARY — The Commission shall appoint a Public Safety Director hereinafter designated as the “Director,” who shall be a citizen of this State and who shall hold his position until removed by the Commission. The Commission shall also appoint an Assistant Director who shall perform such duties as may be designated by the Director. The Director and Assistant Director shall be selected on the basis of training, experience, and qualifications for said positions, and shall have at least five (5) years experience, preferably police or public administration. The Director and Assistant Director shall draw annual salaries as fixed by the Legislature. The Director shall be directly responsible to the Commission for the conduct of all the affairs of the Department. Acts 1935, 44th Leg., P. 444, ch. 181, sec. 5; Acts 1937, 45th Leg., P. 772, ch. 373, sec. 1. HISTORICAL NOTE: The amendatory act of 1937, cited to the text, changed the salary provision of this article which prior to the amendment specified the amount of the salaries and provided for monthly payment. Section 8 of the amendatory act of 1937 declared an emergency and provided that the act should take effect from and after its passage. (1) The Director shall act with the Commission in an advisory capacity, without vote, and shall quarterly, annually and biennially submit to the Commission detailed reports of the operation of the Department and statements of its expenditures. (2) He shall be the executive officer of the Department, and subject to the approval of the Commission and to the provisions of this Act, he shall have authority to appoint, promote, reduce, suspend and discharge all officers and employees of the Department. He shall issue and sign requisition as provided by law for the purchase of supplies for the office and officers of the Department, suitable uniforms, arms and equipment; and make such rules and regulations, subject to the approval of the Commission, as are deemed necessary for the control of the Department. Acts 1935, 44th Leg., p. 444, ch. 181, sec. 6. Art. 4413(7). AUTHORITY TO ISSUE COMMISSIONS – The Director, under the direction of the Commission, shall issue commissions as law enforcement officers to all members of the Texas Rangers, to all members of the Texas Highway Patrol, and to such other officers of the Department as may be employed by the said Department. Acts 1935, 44th Leg., p. 444, ch. 181, sec. 7. Art. 4413(8). APPOINTMENT OF DIVISION AND BUREAU CHIEFS – It shall be the duty of the Director with the advice and consent of the Commission to appoint the Chiefs of the several Bureaus provided for in this Act. Acts 1935, 44th Leg., p. 444, ch. 181, see. 8; Acts 1937, 45th Leg., p. 772, ch. 373, sec. 2. HISTORICAL NOTE: The amendatory act of 1937, cited to the text, completely changed this article, which prior to the amendment, provided that the senior captain of the Texas Rangers, the chief of the highway motor patrol and the assistant director of the department should be chiefs of specified bureaus, and that the chief of the bureau of identification and records should be appointed by the director with the consent of the commission. Art. 4413(10). DEPARTMENT DIVISION – The Department shall be composed of three divisions; i.e. (a) The Texas Rangers; (b) The Texas Highway Patrol; and (c) The Headquarters Division, and such other divisions as the Commission may deem necessary. Acts 1935, 44th Leg., p. 444, ch. 181, sec. 10. (1) The Texas Ranger Force and its personnel, property, equipment and records, now a part of the Adjutant General’s Department of the State of Texas, are hereby transferred to and placed under the jurisdiction of the Department of Public Safety, and are hereby designated as the Texas Rangers, and as such, constitute the above mentioned division of the Department. (2) The Texas Rangers shall consist of six (6) captains, one headquarters sergeant, and such number of privates as may be authorized by the Legislature, except in cases of emergency when the Commission, with the consent of the Governor, shall have authority to increase the force to meet extraordinary conditions. (3) The Compensation of the officers shall be such as allowed by the Legislature. (4) The officers shall be clothed with all the powers of peace officers, and shall aid in the execution of the laws.They shall have authority to make arrests, and to execute process in criminal cases; and in civil cases when specially directed by the judge of a court of record; and in all cases shall be governed by the laws regulating and defining the powers and duties of sheriffs when in the discharge of similar duties; except that they shall have the power and shall be authorized to make arrests and to execute all process in criminal cases in any county in the State. All officers operating by virtue of this Act shall have the authority to make arrests, as directed by warrants, and without a warrant under the conditions now authorized by law, and also in all cases when the alleged offender is traveling on a railroad, in a motor vehicle, aeroplane or boat. When any of said force shall arrest any person charged with a criminal offense, they shall forthwith convey said person to the county where he so stands charged, and shall deliver him to the proper officer, taking his receipt therefor. All necessary expenses thus incurred shall be paid by the State. (5) Special Rangers: The Commission shall have authority to appoint such number of special rangers as may be deemed advisable, not to exceed Three Hundred (300) in number; such rangers shall not have any connection with any Ranger Company or Highway Motor Patrol, but they shall at all times be subject to the orders of the Commission and the Governor for special duty to the same extent as the other law enforcing officers provided for in this Act; such special rangers, however, shall not have the authority to enforce any laws except those designed to protect life and property, and such rangers are especially denied the authority to enforce any laws regulating the use of the State highways by motor truck and motor buses and other motor vehicles. 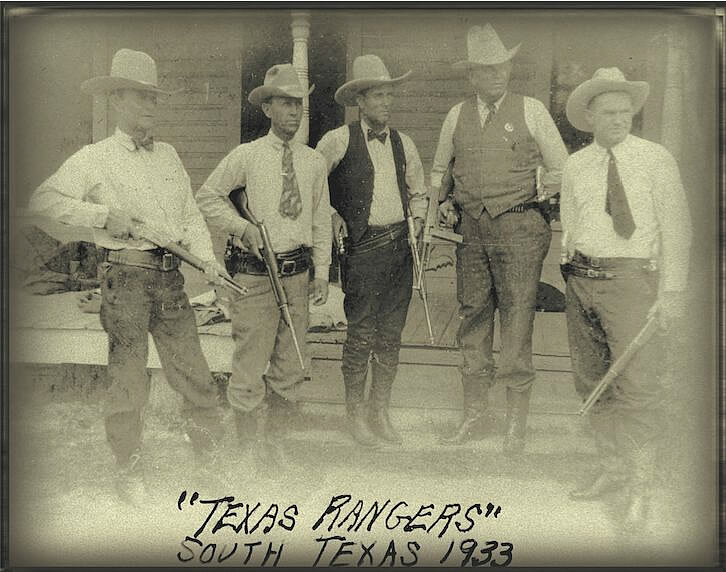 Such rangers shall not receive any compensation from the State for their services, and before the issuance of the commission each such ranger shall enter into a good and sufficient bond executed by a Surety Company authorized to do business in Texas in the sum of Twenty-five Hundred ($2,500.00) Dollars, approved by the Director, indemnifying all persons against damages accruing as the result of any illegal or unlawful acts on the part of such special ranger. All special ranger commissions shall expire on January 1st of the odd year after appointment, and the Director can revoke any special ranger commission at any time for cause, and such officer shall be designated in the Commission as Special Ranger. Provided further that the Commission shall not issue more than ten commissions to special rangers for employment by any one persons, firm or corporation at any one time, except during an emergency, when in the opinion of the Commission it is necessary in the interest of the public justice to permit the employment of more than ten. (6) In the execution of the laws of the State under the Department of Public Safety, the officials shall in all cases where it becomes necessary to seize property and destroy the same, to proceed as now provided by law; and all property so seized shall be stored and a list thereof presented to a District Judge in the District where such property is seized, who shall dispose of same in the mode and manner now provided by Articles Nos. 5112, 5113 and 5114, Revised Civil Statutes 1925. Any official disregarding these provisions shall by virtue thereof be subject to removal from office. Acts 1935, 44th Leg., p. 444, ch. 181, sec. 1 1; Acts 1937, 45th Leg., p. 772, ch. 373, sec. 3.